Today the Defense Department released its "Annual Report on Sexual Harassment and Violence at the Military Service Academies," which found that during the 2010-2011 academic year there were 65 reports of sexual assault at the three top military academies, up from 41 the previous year. Those are pretty concerning numbers, but the Pentagon has made tackling the problem a priority. Certainly that's why it quickly released this information two days after Christmas, rather than waiting until everyone's back from vacation. According to the Washington Post, no reason was given for the large jump in reports. However, the Pentagon says it's been encouraging victims to report sexual assaults, so this may just indicate that the message is being received. A spokeswoman for the Naval Academy in Annapolis, Maryland, which had 22 reported incidents compared to 11 in the previous year, said that midshipmen are given training on preventing and reporting harassment throughout all four years at the school. Col. Reni Renner, vice commandant culture and climate at the Air Force Academy in Colorado Springs, Colorado, said, "We believe that there's much more trust in our system than maybe we've seen in years past." There were 33 reports filed at the Air Force Academy in the last year, up from 20 in the 2009-2010 school year. The number of incidents has remained steady in the last two years at the U.S. Military Academy at West Point, with 10 each year, but the report found that the school isn't in compliance with the Defense Department policy that stipulates training on prevention and response be provided to cadets every year. Greg Jacob, policy director for the Service Women's Action Network, said this proves that the academies aren't doing enough to stop sexual abuse. 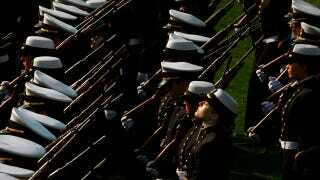 "Ending the widespread issue of sexual harassment and sexual assault in the military starts by ending it at the service academies," she said. "This is a leadership issue, first and foremost, so I also expect us to lead with integrity and with energy to eliminate sexual assault and harassment from our culture ... I'm confident the steps we are taking are the right ones, but we must continue to improve." In addition to just talking about the problem, the Department took steps today to aid those who report sexual abuse. Service members who file a report saying they've been the victim of sexual assault can now request an expedited transfer from their unit, and they must get a response within 72 hours. Plus, records on sexual assault for all members of the military will be kept for 50 years in unrestricted cases and five years in restricted cases to provide victims with longer access to the files.